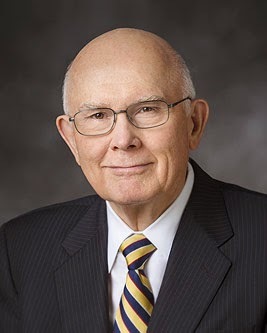 Elder Dallin H. Oaks (1932- ) was sustained to the Quorum of Twelve Apostles in 1984. "The parable of the sower ends with the Savior's description of the seed that 'fell into good ground, and brought forth fruit' in various measures (Matthew 13:8). How can we prepare ourselves to be that good ground and to have that good harvest? "Jesus explained that 'the good ground are they, which in an honest and good heart, having heard the word, keep it, and bring forth fruit with patience' (Luke 8:15). We have the seed of the gospel word. It is up to each of us to set the priorities and to do the things that make our soil good and our harvest plentiful. We must seek to be firmly rooted and converted to the gospel of Jesus Christ (see Colossians 2:6–7). We achieve this conversion by praying, by scripture reading, by serving, and by regularly partaking of the sacrament to always have His Spirit to be with us. We must also seek that mighty change of heart (see Alma 5:12–14) that replaces evil desires and selfish concerns with the love of God and the desire to serve Him and His children." His cautions about the dangers of our time are very worth reviewing, in consideration of our personal progress and status. Labels: Gospel, growth, Oaks Dallin H.